There’s no doubt what we believe about ourselves has a way of becoming our TRUTH even if it’s not based in objective reality. And most of our self-identities about what we are good at, who we are or what we can do is shaped at an early age. Fact is, we have a self-identity for every single little part and parcel of our personality, characteristics and abilities. Taking my almost 11-year old son, Zack, as an example, it would be how well he plays baseball, ice hockey, interacts with teachers, responds to authority, respects rules, how artistic he is, how resilient he is, etc. And that’s a small window; there are probably hundreds of other self-identities beyond these. What were you told as a kid that may or may not be true anymore? Yes, I’m definitely a big believer in playing to our strengths and talents but I also don’t think you can only be a one-sided or one-dimensional character. For my 9-year, Zoe, she is super artistic and creative. However I always like to remind her that’s she’s more athletic than she thinks and I tell Zack he is more artistic than he thinks. Zoe has now has taken on the identity of being the “adventurous” one in the family like daddy, so I’ve been nourishing that. This past week before the kids headed off to sleepaway Camp, Missy and I each took out the kids for some 1-on-1 focused, intentional time together. At the last Maverick Family Freedom event we both heeded the advice of my friend Jim Sheils, co-founder of BoardMeetings. He believes (rightly so) that it’s important to have just one child and one parent for a ‘retreat’. You want to share an experience you both will enjoy. And finally, a real biggie is NO electronics. Yep turn off the phone and technology. So for “Daddy/Daughter Day”, Zoe and I went indoor skydiving as her adventurous activity. It’s a bit of haul from the house but it gave us more time in the car together to talk and hang out. I feel like the best lessons are from actually living them. Of course it’s usually less about what we say and more about what we do. 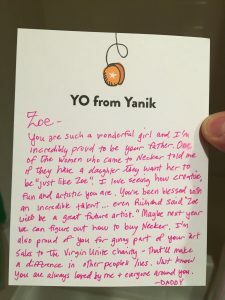 Now I thought I might teach Zoe about giving and random acts of kindness on the way to skydiving. We paid twice for the person behind us at the toll plaza. Usually the person acknowledges you, beeps or catches up to you. I thought that would happen again and Zoe would get a little jolt of joy from that. But no, not this time. I was a little frustrated but then realized the real lesson was non-attachment. I told her receiving the thank you is not important – it’s just the act itself that makes us happy as we pulled into our destination. 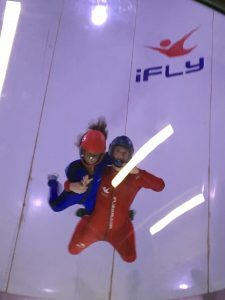 If you’ve never heard of Indoor Skydiving or tried it – think of a giant chamber where they blow air up so you can position your body in such a way to mimic skydiving. Zoe did her first flight and did fine. The second flight is a high-flying one with the instructor where you go much higher in the chamber. I could tell she was getting a little nervous but I just told her to breathe and enjoy it. She made it through flight #2 and was really proud of herself. I’m hoping this moment will add to the mosaic of her adventurous self-identity anytime she feels unsure or scared to do something. The next day was “Daddy/Dude Day” with Zack. For the guys day out, we picked Top Golf and miniature golf as our outing. Top Golf is a driving range that’s been upgraded for the 21st century. It’s very cool and they’re building locations all around the country. Each ball has an RFID chip in it so it tracks distance and where it lands. There are 7-8 holes you are aiming for with different scores for each one. We played a few different games including one where you just aim for one particular hole but you have to hit the ball into each of the 9 different pie-like slices surrounding the pin. Zack did real well at this game. I technically won on points since I hit to the pin and got more points but he beat me on lighting up more areas of the hole. It was a great lesson we talked about over burgers on intentionality and targets. Previous games we just aimed for any of the holes but specifically and deliberately aiming for just 1 hole we each got better. Will that lesson stick? Who knows – but I do know for sure you learn better when that lesson is tied to an experience as an example. After that we hit the miniature golf course and started making up our own rules to make it more fun. Rules like standing on one leg, pool cue shots (ode to Chevy Chase) and backgrounds through the legs were a few of them that made it lots of fun. When we got home we decided we’d put together a new backyard swing we bought a few days before. My own self identity has been the story that I’m not good at anything mechanical. I thought back to desks I put together that leaned to one side or other IKEA-like nightmares. Oh well, I figured it would be a good project with Zack. He loves legos so it made sense he did great on helping put together the swing. 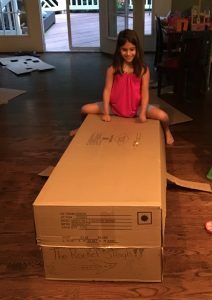 Zoe thought she wanted to help, but after tightening a few bolts she hijacked the huge cardboard boxes and turned them into a fun rocket ship. After we were done I told Zack I couldn’t have put it together without him and he just lit up. 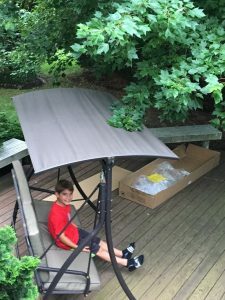 He was so proud of himself and couldn’t believe we built something that we were using now in the backyard. I’ve committed to making sure we have quarterly meetings like this that are scheduled and on my calendar, otherwise they won’t happen. It’s too easy to get busy with work and other commitments when we only have a small, precious amount of time with our kids. Most entrepreneurial parents I know would say they are working hard to help provide for their family. The travel, long hours and sacrifice is for a better tomorrow. The other week I was supposed to go to San Francisco to have lunch with a CEO of a top technology company (his first name rhymes with Zack). It would have been my third week in a row leaving in some way and I had just returned from Haiti. I’ve been showing the kids what we are doing in Haiti and on other trips so they just don’t think I leave for no reason. I was debating if I should go to the West Coast or not. Even though I travel a bit, I have attempted to be home for just about every meaningful event for the kids. Whether it’s a chorus concert or chaperoning a field trip. That kind of flexibility is also a big reason I work out of the house. That way I can play street hockey when Zack comes home from school or hang out with Zoe creating art. In fact, I remember Richard Branson telling me he’s always kept his office in his house to be around everyone. This might be controversial but I don’t believe in sacrificing for someone else. If I decided to stay home instead of leaving for SF it was with intention. How many times have you said yes to something you wanted to say no to? Or vice versa. You only end going to the event/meeting, etc. but really want to be somewhere else. I knew Zack would be thrilled for me to watch him play 2 baseball games over the weekend and that’s exactly where I wanted to be in that moment. Even if this isn’t a ‘forever’ etched memory – it just adds to ongoing story that his Dad supported him. You don’t even need to spend one dollar for an experience to create one of these deep imprints. I love handwritten thank you notes and think they are incredibly meaningful. I’ve sent handwritten notes to my wife, family, colleagues and teammates but never the kids. So on a plane ride home I figured maybe they’d like them. I told each one how proud I was to simply be their dad and then what I appreciated about them. I left the notes on their dressers while they were sleeping to see what happened. Both Zack and Zoe treasured their notes. When you open that note it has reminders of some of the happiest memories she’s had to help her feel better if she has an ‘emergency’ sad feeling. Personally, I still have a note my mom wrote to me that I’ve kept for 12+ years now after Missy and I took her to Vegas while she was going through chemo. 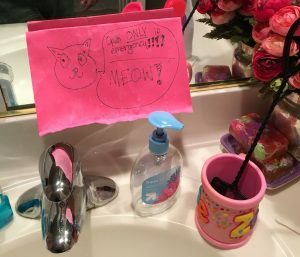 A note costs you nothing but your time and to acknowledge and appreciate the unique awesomeness in your kids. Her father made plans to take her out for a night in San Francisco. Cynthia was just 12 years old. Her father planned the date for months. They have everything planned out including her attending the last hour of a presentation he is giving that afternoon. At the end of the presentation they would meet at the back of the room and leave quickly before anyone talked to him. The evening included catching a trolley to Chinatown, eating their favorite food, Chinese, shopping for souvenirs, seeing the sights and catching a movie. After that they’d grab a taxi, back to the hotel where they’d jump in the pool for a swim. Her dad like to sneak in after the pool was closed she mentioned. After all that they’d order a hot fudge sundae from room service and watch the late, late show. They had discussed this all several times. The anticipation was part of the pleasure of it all. Cynthia felt dispirited. Her daydreams of trolley ride, ice cream sundaes evaporated instantly! Moreover she hated seafood and could just imagine how bored she be listening to adults talk all night. But her father continued, “But not tonight. Cynthia and I have a special date planned don’t we?” He winked at Cynthia, grabbing her hand and running out the door to continue on an unforgettable night in San Francisco with his daughter, just as he’d promised. Again, going back to when you were a kid, what do you remember most from interactions with your family? I bet it something that is really special or something really traumatic in some way. Each of these highly emotional moments are deeply imprinted on us. If that’s the case, then why not consciously create positive imprints for small and big moments? Let me know what you think. Wonderful article. I am doing things like this for/with my niece and nephew of similar age. 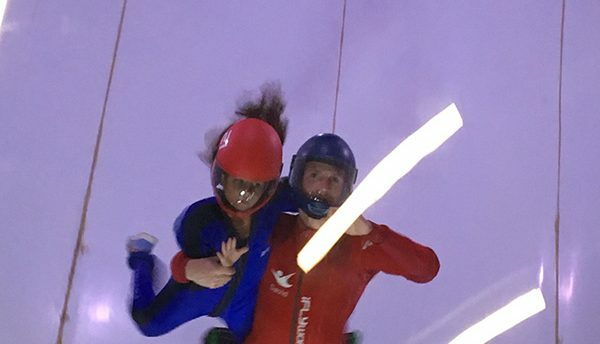 They both loved the indoor skydiving. They wanted to do real skydiving but are way under the age requirement. They also have a “helicopter” mom (always hovering over them) who is an obstacle to them having safe adventures and self-confidence. She won’t even let them spend a weekend one-at-a-time with their uncles. (They are 12 & 13).